The latest ministerial resignations of David Davies, Minister for Brexit, and Foreign Secretary Boris Johnson only underline the complete confusion at the heart of the government and the British ruling class in general. We have catalogued both this comedy of errors and what is causing it in previous articles on the Brexit decision. To briefly recap, two years or so ago the Cameron-led Conservative Party prepared the ground for the Brexit vote that ran contrary to half a century of British ruling class strategy. When Cameron immediately resigned, the Conservative Party retained its historic survival instinct and crowned its new leader by “popular acclaim” rather than any democratic charades. As we publish this (Tuesday, July 10th), after two years of sinking into the Brexit quicksand, Theresa May only remains Prime Minister because her party is unable to agree a willing successor. Until 2016 the British ruling class, despite its well-known deep divisions on the issue, rode out the insoluble economic crisis, firm in their strategy of membership, albeit with certain qualifications, of the European Union (EU). By 2018 the global economic crisis threatens the biggest tariff-driven trade war since the 1930s. 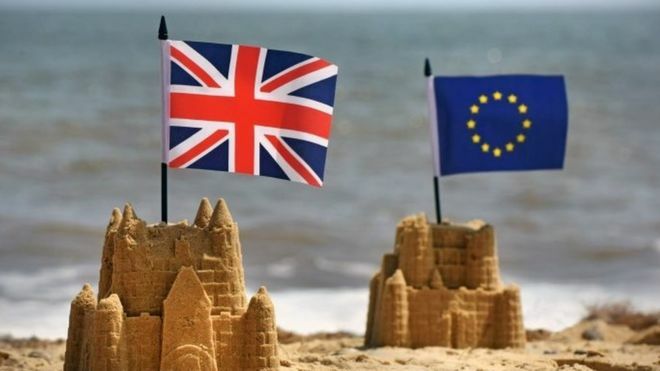 The risible decision to hold the EU referendum without a built-in get out clause has left all the political parties unable to agree an option best suited to business and financial profitability. They are caught in a kaleidoscopic chaos. While Labour is paralysed by its own incoherence over the EU the Tories are riven by the ambitions of swollen-headed politicians play-acting about bulldog Britain re-establishing its rightful place in the world. With the prospect of a no deal Brexit looming, supply chains broken and import tariffs beckoning, the CBI – spokesman of business in Britain – has finally raised a sceptical voice. How is Brexit going to help “productivity” and access to – so far nonexistent – new markets? Behind all this lies around half a century of a deepening, insoluble global crisis of capitalist profitability. Despite all the “lessons from history” which were supposed to avoid another Great Depression and the trade wars that preceded World War Two there are ominous signs of a new world capitalist disorder, where the world’s working class will pay the price. The working class in the UK has no reason to support any of the factions who are squabbling over Brexit. Wage workers have no interest in the particular political and economic framework of the structures which are designed to get as much ‘productivity’ as possible out of us for the benefit of capitalist profits. Thus the British bourgeoisie has created a political crisis for which they have no easily deliverable solution. The squabbling between and within the political parties will deepen over the coming weeks and months. There are numerous possible options – none of which will solve the divisions within the British ruling class. Currently, they are trapped in a situation where the factions are unable to generate a plan which can satisfy both the EU and their own competing sets of followers. As always, for those who want a sustainable, human future we have to argue for resistance to all the siren voices which lead workers into the camp of any of the bosses’ factions. The mass march for a “People’s vote” on 23rd March was one effort at dredging up a cross-class mishmash. It won’t be the last. Populists of the right and left circle like vultures to spread their quackery and deceit. The Labour Party, as riven by Brexit divisions as the Conservatives, remains a strategic option for the ruling class to prolong their own agony and try and enmesh workers into arguments none of which are in our interests. Hard Brexit or soft Brexit, bizarre Customs arrangements – whether achievable or not, “People’s Votes” or second referendum, Tory or Labour Government provide no escape from the bosses’ crisis or their efforts to make the working class pay for it. The problems facing workers in Britain will not be solved by the British bourgeoisie fully retaining their position in the EU. Neither will they be solved by the ruling class totally scrapping all links with the EU – or any of the endless scenarios between the two extremes. What there is no doubt about is that the attacks on our conditions of life will continue. Instead of watching the Brexit pantomime we workers would do well to turn to organising for ourselves to resist the perpetual undermining of our standard of life. This means first of all overcoming the divisions that capitalism has nurtured so assiduously. In the process it will also be necessary to throw off the ideological and organisational shackles of the “Labour Movement” – the intertwined Labour Party and Trades Unions and their countless emanations and camp followers. Fundamentally, Brexit is an offspring of the capitalist crisis which is not going to go away. The attacks on every aspect of life, from how we work and how we live will continue. In this world of plenty where a miniscule fraction of the population lives at the expense of the vast majority the question is posed, “Surely there is a better, community-based way to organise who gets what?” The Brexit fiasco is just one example of how capitalism is running out of plausible options. The trajectory of the capitalist crisis will pose the question to the rest of us, to the world’s working class: how to find a more civilised way to live? It is up to the revolutionary political elements who already exist to organise and put forward a revolutionary alternative to the working class as a whole. Those who share our perspective will not be drawn into the bosses’ squabbles and diversions. There will be no quick fix. The Brexit crisis highlights yet again the need for our readers to work with us in the struggle for an organisation to provide a clear understanding of our potential as a working class to create a new truly human world – a world based on satisfying needs not generating profits. and many others on our site leftcom.org. Bosses' Political Faction Fights – Not Our Problem! also has a commentary on confused Keynesian economists responses in terms of 'free trade' versus 'protectionism' in their advice to the EU and the UK.